When it comes to onsen, Japan is filled with many of it that it’s actually kinda of difficult to suggest only 1 out of the whole list as each of them has its own specialty, in terms of water benefits or location. One of the best onsen places around that everyone seems to know is in Hakone but what if I told you there is one that you should try out to stay youthful? There is such onsen and I wasn’t kidding about the “youth” part as the water mineral properties contains high concentration of natural salts and iron that tinges the water with a copper color that is known to slow down ageing and relieve sore joints/ muscles. The water color might shock some too as it isn’t like your usual fresh, clear underground water instead it’s murky water surface appearance may seem intimidating but that’s nothing for you to worry about because that’s the water’s natural appearance due to its high mineral content and it’s actually named “gold bathwater” (kin-onsen). 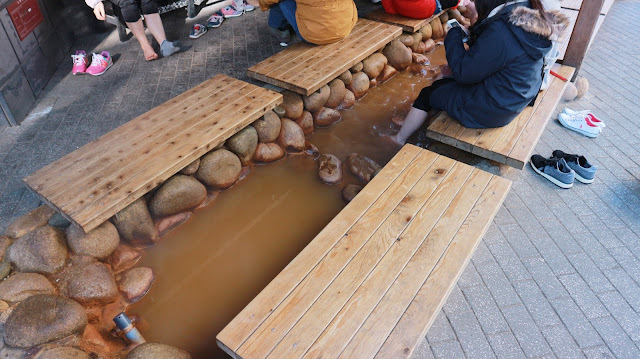 The other type of hot spring available is the silver hot spring called “Ginsen” which is a clear version, that contains radium and carbonate which is said to cure various muscle and joint ailments. Carbonated water is also known to produce smoother skin by removing dead skin effectively. This unique onsen is only found in the mountainsides of Kobe and it’s actually famous among the local elderlies living around the area. Now it’s no longer limited to a certain age group as the onsen’s benefits are slowly starting to attract people of all ages around the world. And it isn’t also too far to make a day trip down just to relax your tired body in natural hot spring after a long week of hard work. Arima Onsen is also one of the OLDEST hot spring resorts, dating back to a thousand years and its considered one of the top ranking hot spring resorts for Western parts of Japan. 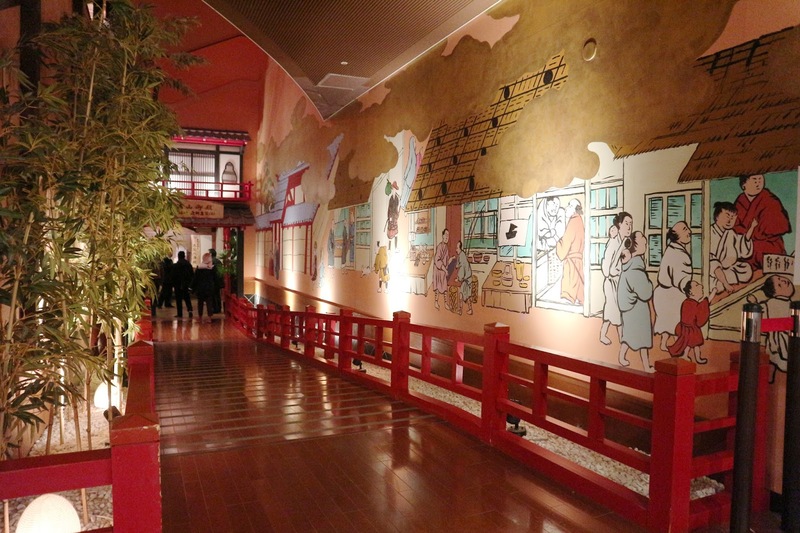 Unlike some Ryokans, visitors can actually pay to use their onsen without having to stay the night which was what I did when I visited! It’s a common Ryokan rule to stay at least 1 night in order to use their onsen and they mostly accept couples (minimal 2 ppl), it’s rare to find one that accepts a single person booking from my personal experience. Due to some traveller’s schedule they might not have the luxury of time to stay the night but yet would like to experience a proper onsen, I would highly recommend for them to try out Arima Onsen area, bath entry costs ranges between 500yen- 2500yen depending on each Ryokan/ bathhouse. 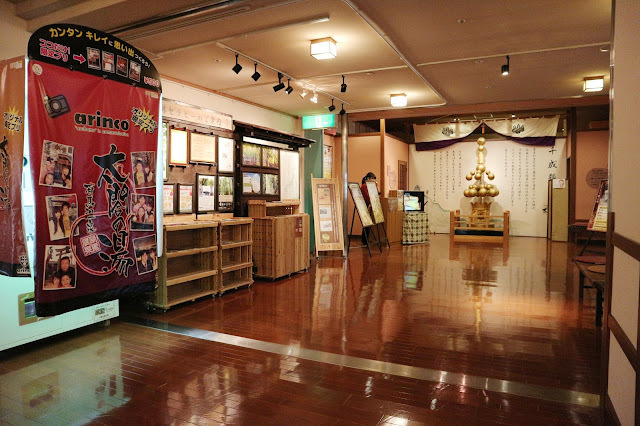 We totally enjoyed our kinsen experience here, wished we could soak longer! 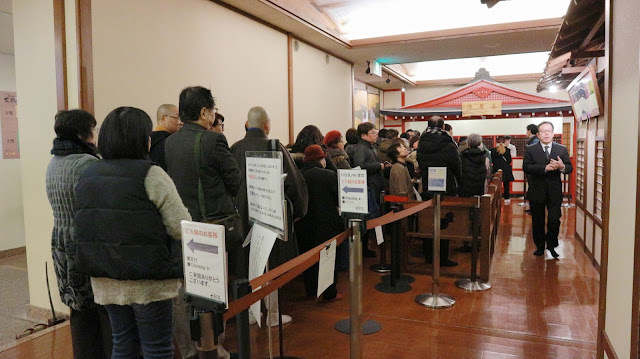 The one I went is pretty famous and packed with people called Taiko no Yu, but don’t worry on average one would usually only spend an hour or two in an onsen or else you’ll faint from spending too much time in hot water being boiled like a lobster. I’ve tried soaking once for an hour max, and came out super duper light headed (dizzy) after that I know that I shouldn’t soak more than 15-30mins without cooling down and going in for another round. Same goes to using a sauna. It's a complete onsen facility with souvenier shops and restaurants in it as well. Not everyone is comfortable with baring their naked bodies among strangers but trust me, just look down if you are shy (anyway you gotta be careful when you walk as well because it’s slippery) , and there is a long small towel for you to hide your bits in front before getting into the hot pool but make sure to wrap the towel around your head and avoid it (towel) from getting contact with the water as it can cause contamination. Bathhouses are often split into male & female section, there are some that are both gender friendly that requires a swimsuit. Some muslim women might be shy in removing their headscarf or exposing their body among other women but there are also onsens that allows muslim customers to bath in their wet suit. But overall, there is nothing to be shy of because everyone has the same bits and we are only interested in cleaning ourselves instead of ogling at others as it is also rude to stare. Here are some onsen etiquette that tourists needs to be wary of, once you get a hang of this it’s the same rule that applies to every bath house. Get your towels from the main entrance, you’ll be given 1 big body towel for drying and 1 small body towel to help you scrub yourself. Remove your shoes and place them at the outside shoe locker, if there are slippers provided for inside usage, please use them. Lockers are provided for your clothes, so make sure to not lose your key by wearing it around your wrist. Before entering the hot pool, bath yourself thoroughly with the provided shower area, each individual booth as a stool for you to sit down and wash up with the facewash, shampoo, body soap and hair conditioner provided. Make sure to wash between your toes as well. Once you are clean, then you may enter the hot pool and soak in it. Make sure your small scrubbing towel is wrapped around your head or put at the side of the pool. After you are satisfied with the soaking in the hot section you may cool yourself down at the cold water pool to close your pores as well. Dry up, moisturize (facial and body lotions are provided at the make up table), dress up and head out. Don’t hog the place too long especially when it’s crowded. Don’t forget to enjoy a bottle of cold milk outside the locker room before leaving the vicinity for a 100% Japanese onsen experience! 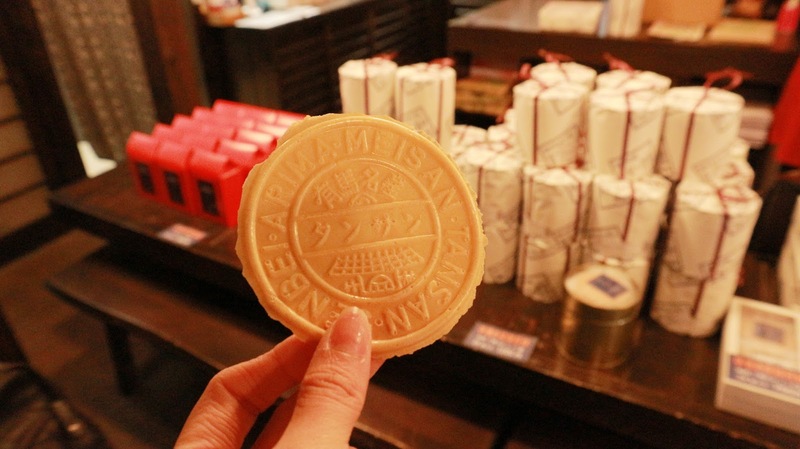 Aside from soaking in hotsprings, you can also walk around Arima Onsen's Yumotozaka street to enjoy some souvenir shopping and try some of their local food specialties like this rice cracker made from Arima's natural hot spring water. It's very delicious and makes a great gift for friends and family! Arima was greatly admired by a monk named Gyoki who's statue now proudly stands within the vicinity of this place. Beautiful temples and shrines can be found around here as well. As you walk around Arima, you can find interesting stone carvings like these outside of shops, not sure what is their purpose whether it's for protection or just decorative pieces but they are beautifully crafted. 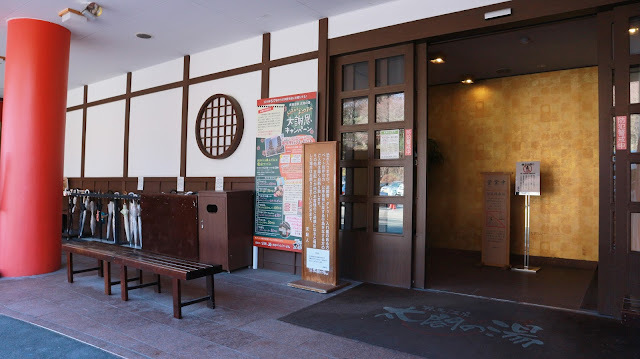 Hope this information is useful for those of you who are looking to enjoy a memorable onsen experience at one of the oldest hot springs in Japan.